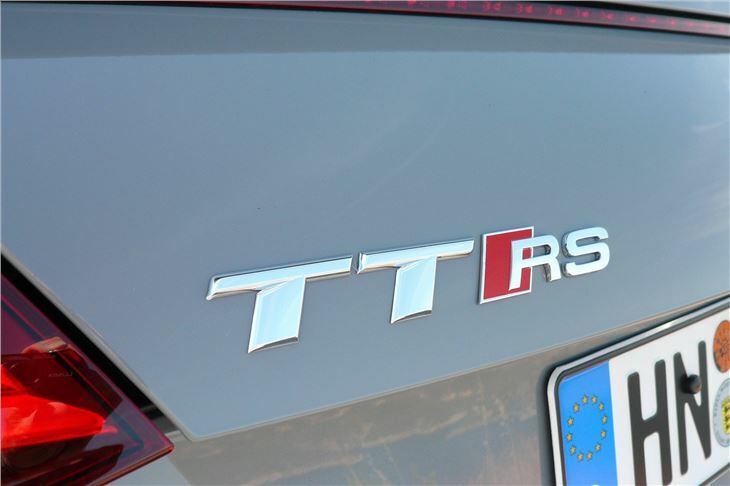 The 2016 Audi TTRS has a new, lighter engine, more power, more torque and more standard equipment. 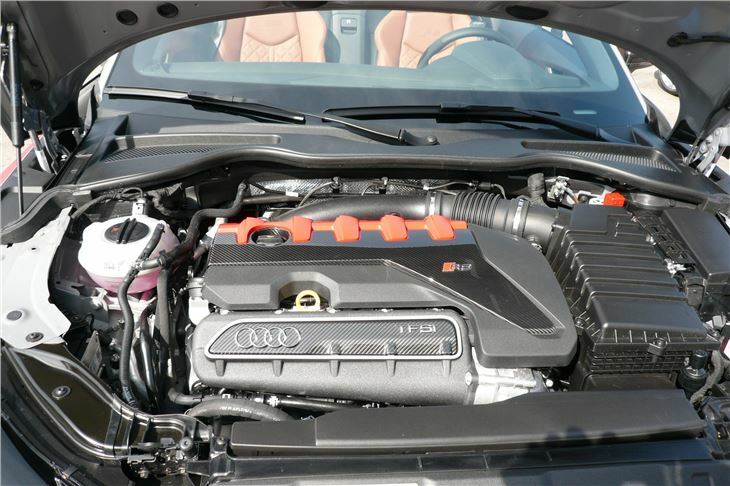 Audi is pitching its 400HP, 480Nm torque, new wet clutch 7-speed s-tronic and quattro four wheel drive 4-seat coupe against the Porsche 718 Cayman and Alfa Romeo 4C. And its 2-seat TTRS roadster, against the Porsche 718 Boxster, BMW Z4 sDrive35is auto and the Mercedes Benz AMG SLC 43 auto. The similarly equipped 718 Cayman S PDK + Sport Chrono and Alfa Romeo 4C TCT coupe are similar money at around £52,000. 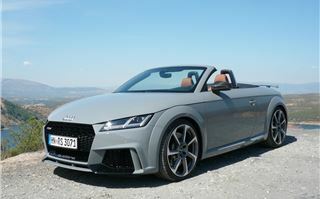 So are the £53,550 TTRS roadster and the £54,033 Porsche 718 Boxster S PDK + Sport Chrono. But the gap widens when the £47,915 BMW Z4 sDrieve35is auto and £46,360 Mercedes Benz AMG SLC 43 auto are taken into consideration. And then there’s the BMW M2 7-speed M DCT at £46,715 OTR. 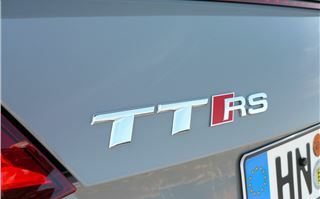 However, unlike previous Audis, the new TTRS includes quite a lot of tasty standard kit. The virtual cockpit display on a high definition 12.3-inch TFT screen directly in front of the driver is killer. Makes you wonder why so many other cars have a separate central screen. 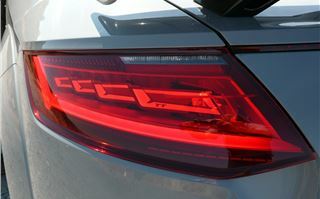 Though a small disadvantage is that a quarer turn of the steering wheel obscures the reversing camera screen. 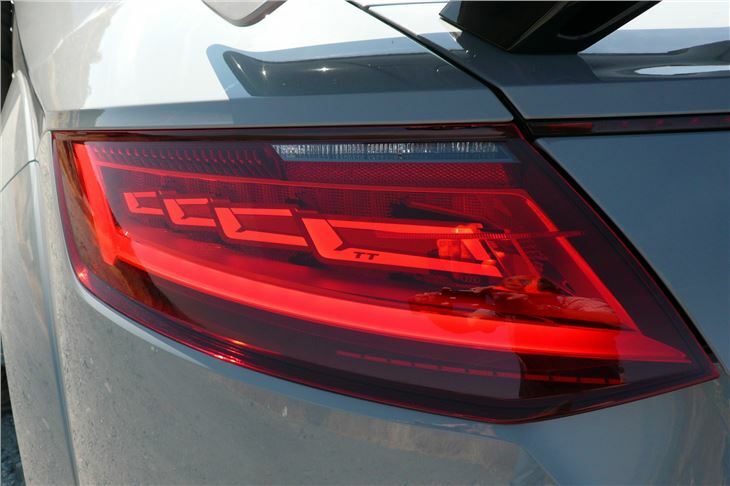 It’s configurable to show 3 views, including a special RS screen that highlights the rev counter and provides additional performance data, plus a rev limit shift light. 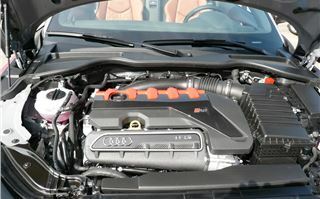 The virtual screen also interfaces with Audi Connect services with 3-year subscription. These include Google Earth mapping, Google Street View, online weather updates, travel information, news, access to Twitter and integration of a Wi-Fi hotspot for Internet access on personal devices. 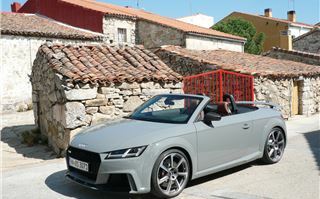 Audi phone box enables compatible phones to be inductively recharged and paired with the car’s antenna for optimal reception. You get fine Nappa leather sports seats with multiple adjustment including variable clinch side bolsters to keep you firmly in place. A super grippy leather and Alcantara covered steering wheel. There’s even a button to make the exhaust louder. So all the important basics are there without having to delve into the extensive options list. 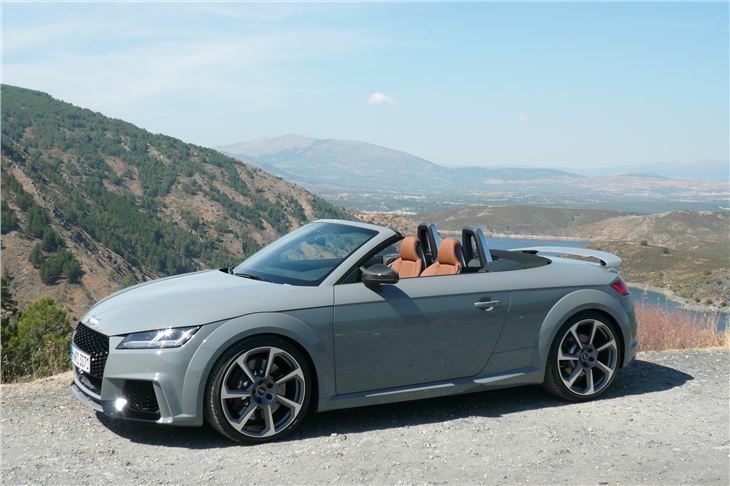 But while the original 2009 TTRS had a then extraordinary 340HP and 450Nm, this one trumps it with 400HP and 480Nm and on power output alone it puts its competitors into the shade. It also trumps the BMW M2 with a 0-60 of 3.5 seconds against the BMW’s 4.3, both achieved using the cars standard launch control systems. Yet it’s pleasantly docile and easy to drive at low speeds. No histrionics or worries about gear engagement. You can pootle or bimble about as if you’re driving a Honda Jazz. Out on open roads you appreciate the important difference of being able to accelerate hard and reign the car in as required. And, though it obviously gripped tenaciously, we weren’t going to push it hard round blind corners. 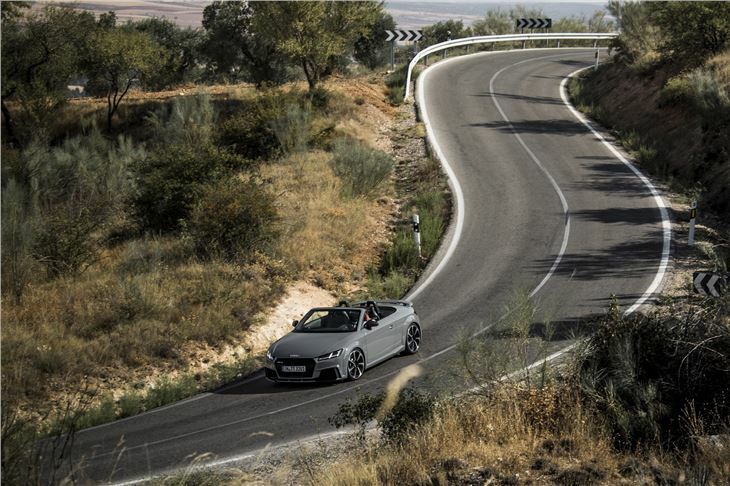 We were provided with Madrid’s Jarama race track to do that. 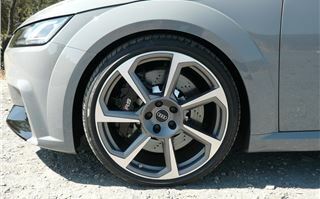 The circuit cars were fitted with optional carbo ceramic brakes and 20-inch wheels with 255/30 R20 tyres. The virtual display in front of the driver was set to RS mode to display revs, gear and speed and flashed orange to indicate change up points. As always on an unfamiliar circuit it takes a while to get the cornering lines, braking, gears and speeds right but, happily, the new 7-speed wet clutch s-tronic is vice-free and does what it’s asked very quickly. No way anyone could change gear as fast as that manually while simultaneously braking into a corner. Not a lot of understeer either, despite some very testing bands at Jarama and the car could actually be thrown into some of them. 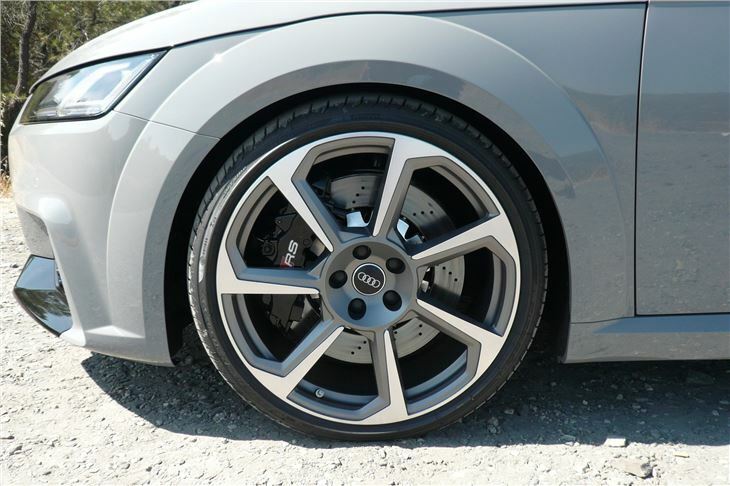 All the road cars were also on 20-inch wheels with 30 profile tyres that should be a recipe for discomfort rather than comfort. In the first car, magnetic ride sorted out the surface imperfections, but even the second car on ‘Sport’ suspension was okay. Nothing like the rock hard early 2nd generation Audi TT Sports that could get you more involved with a chiropractor than Christine Keeler did. 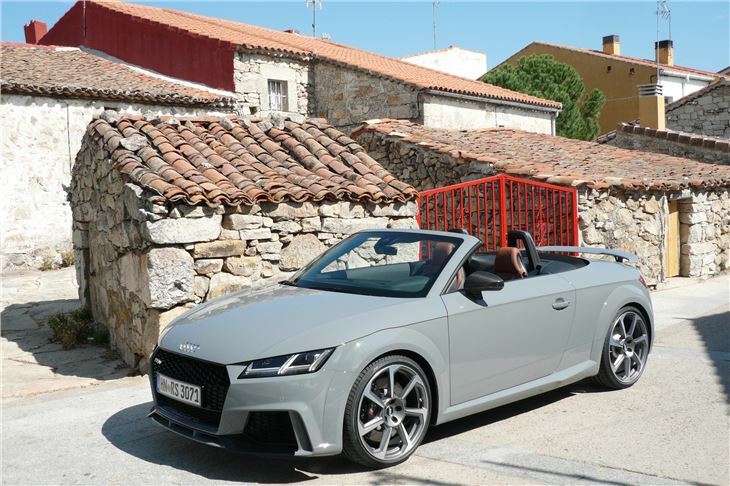 Also very impressive compared to the 3nd generation TT roadsters is the quietness and lack of buffeting top down in the cabin, helped by the perforated electric screen that rises at the touch of a button behind the seats. Conversations can be held at fairly considerable speeds and there is simply no reason at all apart from rain or extremely low temperatures not to drop the top at every opportunity. 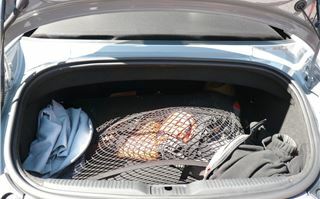 You can happily cross continents (Spain in particular) two-up with a secure long, wide but shallow load compartment behind you that takes 280 litres. The man with a tan drives an Audi TT roadster. 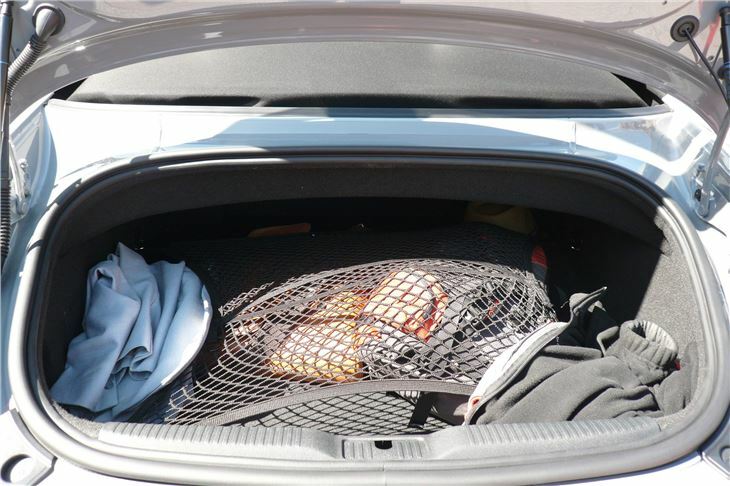 And yes, I did pop the question about leaks from the roof into the electrics under the trunk floor. Audi engineers put their hands up straight away and told me it has been an issue but was now fixed. 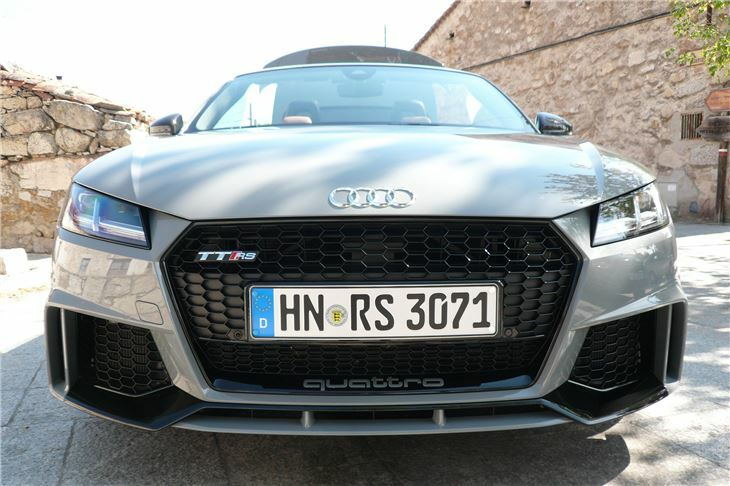 So, it’s big money and it’s still not quite as pure a sportscar as the Porsche 718 Boxster, but it’s a tad quicker and with its quattro all wheel drive system is probably safer, particularly in winter. You could spend the same money on a Range Rover Evoque convertible. But if there’s just two of you, you wouldn’t, would you?